Tonight on Locals Only we have Al Foul live in Studio 2a at 9pm. 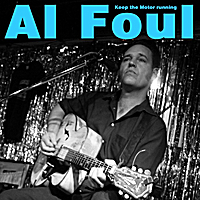 Al Foul is a legend for local roots rock and rockabilly. His one man band sound features guitar, vocals, kick drum and the stomparine, played all at once on great original tunes and has earned him the name: The One, The Only - Al Foul. He'll be featuring tunes from his great new album, Keep The Motor Running, for the live performance on Locals Only.